Part 1 Here: In the fine book “I.O.U.S.A.” former Comptroller General David Walker said, ”[The] fourth and most serious of all is a leadership deficit.” The material I reviewed underscores Walker’s observation. I’m a huge Paul Ryan fan. I’m impressed with his handle on our budget. I give him a tremendous amount of credit for addressing our dismal fiscal situation head on. I commend him for making it the center of his work. This is something most politicians refuse to even mention, let alone address in public. Congressman Ryan is working to solve it. As much as I like, admire and respect Representative Ryan - I have to sate: He epitomizes Walker’s illustration of our biggest deficit. He does not have the economic vision to see the picture and he is therefore stunted from forming a dynamic and cohesive plan that will solve our problems. 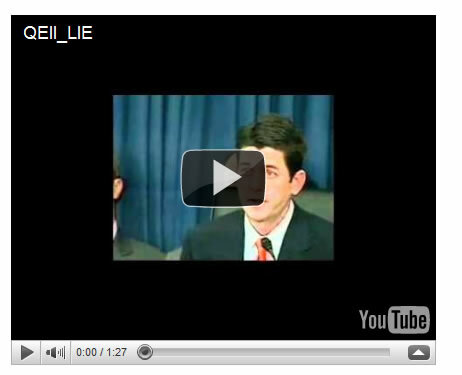 This is entirely evident from the compilation of video clips. Remember the Corrective Procedure [memory items] - and if there isn’t a procedure—create one. Execute the Plan - and if you have any weak links in your crew remove that link immediately—rely on the strong points of your team. 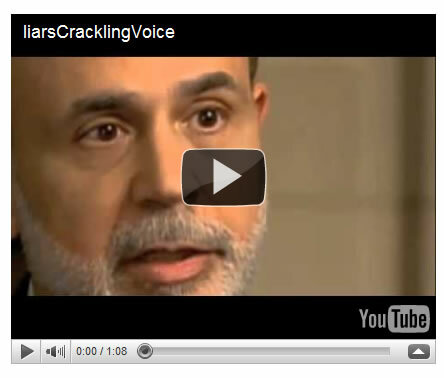 Bernanke is by definition a weak link. Obama should have fired him. He and Greenspan created the housing bubble. They deserve no rewards for ordering a 10.4 trillion dollar carpet to sweep their mess under in order to hide and prolong the disaster. Paul Ryan should have used this opportunity to publicly condem the man and demand the idiot's resignation. You can see by the videos that the committee is bumbling around in the dark feeling its way around. Identify the Problem: We are insolvent. We take in less than we spend. Our current fiscal situation is that we take in about 2 trillion in tax revenue, we borrow about 1 trillion and we spend 4.5 trillion. Annunciate the Problem: Bernanke is destroying our currency by monetizing our 1.5 trillion dollar shortfall electronically. His intention is admirable—he wishes to avoid defaulting on our debt. The downside to this is that it expands the money supply because the money has already been spent by our overextended government. Please read that again. The money is not sitting in a bank or over at the Fed, this money has been spent. Without this monetization Social Security payments would not go out, debt service to China et al would not be made, government workers would not get checks. Bernanke is fooling himself (and us if we listen) that when the time is right he’ll contract the money supply by selling assets - the buyers have not been there, they won’t magically appear. You can’t contract a money supply without creating a deflationary depression. Furthermore, if we can’t sell 1.5 trillion more treasuries today to China et al no one in their right mind would buy into that in a month, several months or a few years from now that China or any other investor will want to buy more of this debt. Verify it: The GAO verified it, lack of demand has verified it. Going to the IMF (the financial hit-men) and getting a high interest loan in giving them our resource rights as collateral (bad idea). Defaulting (bad idea - won’t fix the consumer, state or municipality collateral damage). 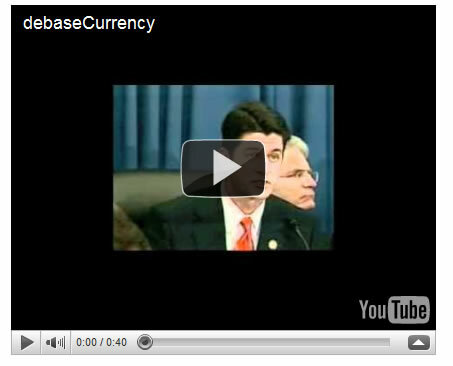 Sneakily debasing the currency and paying old debt with worthless dollars created with a computer and keyboard (what Bernanke is knowingly or unknowingly doing)—a painful hard way of doing it. Commodity prices are pegged to the reserve currency, exporting inflation to countries where people make 2 bucks a day is a recipe for the other countries revolting from the US reserve or winding up in deposed induced anarchy. If we are not the reserve currency we will be like Greece—unable to print money and left with more debt than we can ever pay. Governor Christie is about to learn this lesson. Re-valuing the currency by saying bring us 100,000 old dollars and we’ll give you one new dollar, which usually diminishes faith, causes a great deal of pain and sometimes takes several attempts before success is achieved. 5. Execute the Plan: Paging President Teleprompter. During one of these FOMC meetings Bernanke asked about a chart showing the value of our dollar losing 10 percent per year. Ask yourself: Just how that plays into the Fed’s dual mandate of maintaing price stability by preserving the value of “our” currency? Just where can you put the savings from your flat, circa 1970s wages, to work and get 10% per year? No small wonder why gold was up 29% last year and silver was up 89%. The long bond (30 year) is tanking, the 3 decade old bond bull market is finished! This is evident because the yield busted the 10 year moving average when it blew above 4.75%. Money moves out of bonds when central banks print. Money flows into hard assets, gold, silver and commodities when central banks go berserk. The central banks will have to come in and buy more bonds in order to drive bond prices up, inversely lowering yields/interest rates. Bernanke’s QEII won’t hold rates down, there is not enough Fed bond buying. It’ll take QE III, QE IV, and QE V to dominate the bond auctions and drive rates below 4.75%. When that happens the dollar will have the value of toilet paper. So to answer the question: “How does monetizing the un-payable portion of our deficit play into preserving the value of the dollar?”—it flat out doesn’t. That is why our dollar has the purchasing power of 4 cents. The Fed was created 100 years ago, the dollar lost 80% since Nixon took us off the gold standard in 1971. The dollar will literally be worthless when Captain Bernanke completes his flight. The engines (read: the printing presses) are melting the wings off the plane. Bernanke is kidding himself, the House Budget Committee and the entire 60 Minutes audience when he says that he can raise interest rates in 15 minutes. He can raise rates but it would be the INSTANT end of the economy. I’ve read the book: “Temple of Secrets: How the Federal Reserve Runs the Country”, and a large portion of the book was dedicated to Paul Volcker’s 21.5% rate hike. The adverse effects on the economy were disastrous. Businesses stopped borrowing, or went broke borrowing, unemployment went through the roof, housing was crushed, large purchases of automobiles crumbled. When someone’s voice crackles it indicates a total lack of confidence in what they are saying. They are not being truthful. ‘The fear of inflation is overstated’ — Like the housing bubble Ben? ‘We aren’t printing money’ — BS. ‘The money supply isn’t changing’ — The government spends roughly 1.5 trillion more than it takes in with taxes and borrows (there are 1 million "millions" to a trillion www.vemeo.com/4428480 only 21% of our nation know this fact). Spends is the key word Ben, the money supply IS increasing, the government spends money it doesn’t have and you create it. ‘What we’re doing is lowering interest rates’ — Not working Ben, money left the long bond, rates blew out to 4.75% breaking the 10 year moving average signaling the end of the 3 decade bond bull market. It’ll take massive amounts of QE to sop up enough bonds to drive rates down and bond prices back up. It’ll toast the dollar’s value. Supply and demand is the key law to economics and even money supply has supply and demand issues. Economics 101 Ben. ‘Trick is to unwind it at the right time’ — IMPOSSIBLE, your the only one buying this trash. There is NO demand for this crap. Time or timing won’t change that. You are bluffing yourself and us. This is another “Housing isn’t in a bubble, I don’t agree with your premise” delusion. Time will - once again—show you for the inept economic moron you really are. And by the way Bernanke, housing prices have declined in our nations history, it happened during the last Great Depression, you know the one you profess to be an expert on! But the single biggest reason the Fed can’t raise rates is debt service. 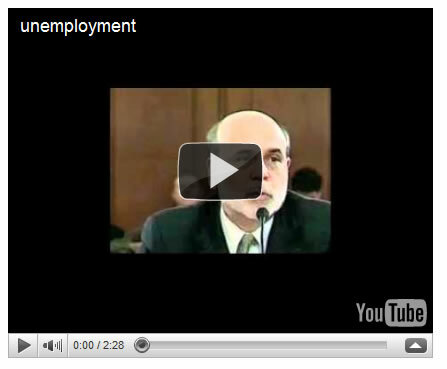 It is right in Bernanke’s testimony. Just the cost to service our debt would go up to 6 trillion if rates went up. RATES CAN NOT BE RAISED - ONLY A REVALUATION OF THE CURRENCY AND MIGRATING BACK TO A GOLD STANDARD CAN PREVENT INFLATION. Paul Ryan did the math. 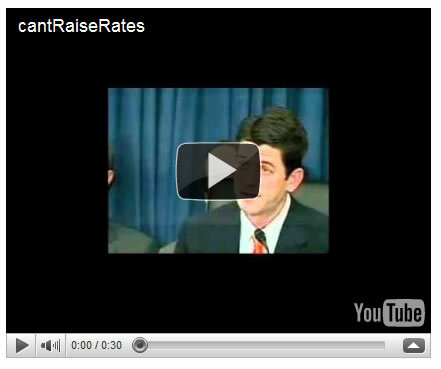 Why he or anyone else listens to Bernanke say he can raise rates in 15 minutes is absolute absurdity. 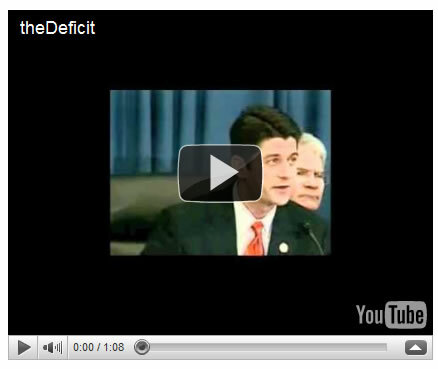 $1,500,000,000,000.00 deficit - Which Bernanke is monetizing. Sound money - Can’t have it with monetization. Public Debt is Now 69% of GDP - Let’s not forget that public debt is about 14 trillion and the off balance sheet debt (Social Security 14.6 trillion, Medicare 76 trillion, Prescription Drugs 19.2 trillion and GSE is about 3 trillion), all toll you have about 128 trillion of debt. Then think about the states and local municipalities. Greece starts to look good. Sorry Paul, you can’t have an economy with a consumer that has been bled to death with taxes hidden and overt. Bernanke lies and says it isn’t monetization he goes onto say that the money supply will be contracted — BS, the money has leaked into the economy vis-a-vis Social Security payments, government salaried workers, China et al receiving debt service on bonds and so on. Unemployment discussed is based on 9.6% — Unemployment is actually 22%, if you aren’t aware of that you’ll want to watch the Crash Course mentioned and check out www.ShadowStatistics.com. Basically the numbers Bernanke and Congressman Mulvaney use to calculate how long before there is an economic turnaround are predicated on half () of the actual rate. Bernanke should have been slammed on this. While Mulvaney is one of the brighter bulbs in the room he clearly has more pets and chickens than economic horse power. We can expect over a decade (barring a bubble, some energy invention or the clearing of tax debt and personal debt) before rates get back to where they were. A 3.2% GDP growth rate is also discussed — Again, you’ll want to watch the Crash Course chapters outlined above if you don’t have a clear understanding of how the government calculates GDP. We didn’t have a 3.2% improvement in GDP. The Fed’s FOMC minutes discuss CEO’s desire to exploit LDC (Least Developed Countries) labor rates. Either one of two things will happen: 1) We get the manufacturing jobs back, wipe away the debt and flourish or 2) We endure a depression and our wages get reset to that of the LCD’s (2 bucks a day). Again, Mulvaney and the rest of the gang should have chastised Bernanke for condoning discussions about exploiting labor as acceptable and routine. Our leaders chose the fixing of roads as incentive. It takes 121,600 gallons of oil to pave 1 mile of highway. China is way behind on their roads. Chris Martenson suggested in a podcast that people be put to work insulating houses to save oil. 67% of the economy is driven by consumers, if you read Jim Quinn’s article, The Shallowest Generation, you’ll see that consumers got their money from credit, that is how the economy thrived. 9 billion borrowed dollars wracked up on HELOC’s and spent at Starbucks on 4 dollar coffees is a case in point. We have massive debt and 22% unemployment because we gave good jobs to China so CEOs could make 400 times what their workers here earned. In Summary: This will, without a doubt be another Katrina. All I witnessed was 2 hours of empty words and a tremendous amount of chicanery on the Fed’s part. We can’t get to a stable monetary system stuck on this flight to hell. I am deeply saddened that Paul Ryan won’t be a good leader until after he learns from this colossal failure. I'm an ex-airline captain with about 15,000 hours and am amazed at all the BS we are taught. Most of my friends still in the business were also taught the wrong aerodynamic principles with respect to what makes planes fly. Aviation or economics, Keynes to Austrian - Bernulli to Newton we've been sold bad goods. It's amazing anything works as backwards as we do things. © 2011 Copyright D. Sherman Okst - Disclaimer: The above is a matter of opinion provided for general information purposes only and is not intended as investment advice. Information and analysis above are derived from sources and utilising methods believed to be reliable, but we cannot accept responsibility for any losses you may incur as a result of this analysis. Individuals should consult with their personal financial advisors.